The large diameter ¾” HiFlow Mixer is specifically designed for use on Cox and Albion sausage guns. It is the preferred mixer for DOT expansion joint work, and the only mixer recommended by Dow Corning for the 902 RCS material. 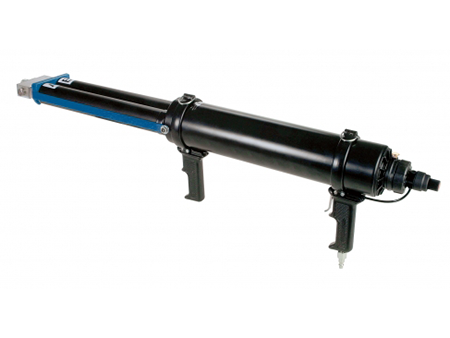 This mixer is made from clear PVC pipe and is available in 1/2" to 2" diameter in Schedule 40 PVC, and in 1/2" and 1" in Schedule 80 PVC. Its many uses include biodiesel production, process control sampling, PH control, waste-water treatment, chlorination and ozonation, Koi Ponds, Hydroponics, and so much more. Key benefits are low cost, long service life, ease of installation, and no fouling. We keep most sizes of TAH Bell static mixers in stock. Diameter sizes range from 1/4" to 3/4" and come in a variety of lengths. We can make custom static mixers to meet your specifications. The ones shown were made for a Seattle-based injection molding company. 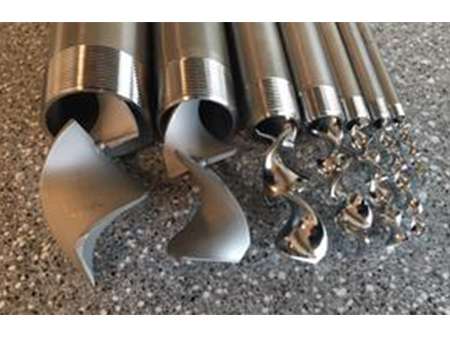 Stainless steel Pipe mixers are used for biodiesel production, process control sampling, chlorination and ozonation, waste water treatment, PH control, and much more. 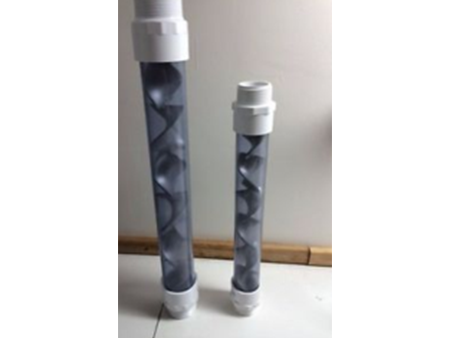 They are available in pipe sizes of 1/4" through 2". 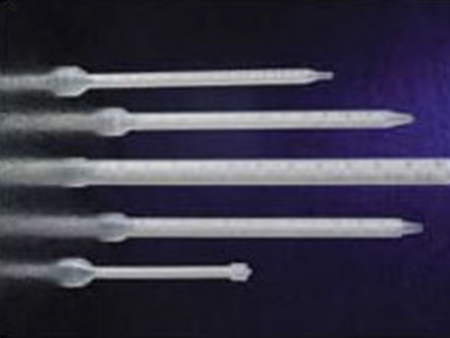 Tube mixers come in a variety of lengths and diameters ranging from 1/4"-3/4". Static mixer elements are available in a variety of sizes (number of elements, diameter, and length.) Elements are inert to all common solvents with a maximum service temperature of 250 degrees F.
Dispensing valves and manifolds for two component reactive materials. Dual Component Applicators - Available in sizes 25-750 ml. Intended for high-flow cartridge applicators. 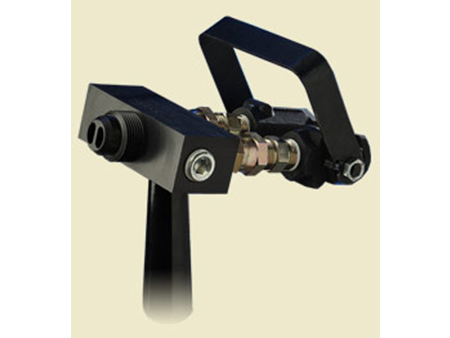 These 3/4" mixers are ideal for high viscosity dispensing and in cold weather applications. This mixer is available with 16 or 20 elements. The mixers have two standard inlet threads: 7/8"-9 or 7/8"-14 double lead. The outlet has a 1/2" MNPT outlet for connection of 3475-EXT extension tips. 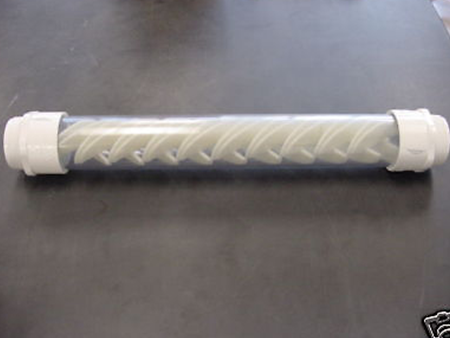 The StatiFlow Clear Mixer is a clear PVC pipe mixer available in ½” - 2” diameters in Schedule 40 PVC and in ½” to 1” diameters in Schedule 80 PVC. Its many uses include biodiesel production, process control sampling, PH control, waste water treatment, chlorination and ozonation, Koi Ponds, Hydroponics, and much more. Key benefits are low cost, long service life, ease of installation, and no fouling. Static Mixer 2" ID "clear" Schedule 40 PVC process mixer. Available in 1 or 2 stage; 13" or 20" lengths. 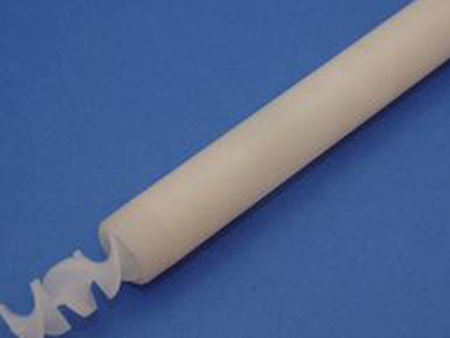 Static Mixer 1 1/4" ID "clear" Schedule 40 PVC 2 stage. Available in 2 lengths, 10.5" and 16.75". This mixer has been developed for low viscosity mixing applications, and is used for Hydroponics, irrigation, pool and spa ozonation, chlorination, waste water treatment and much more. Each stage consists of modular semi-elliptical baffles. These baffles are aligned along a central shaft with two intersecting bottom baffles and one opposing top baffle. As fluids pass through this mixer, they are divided into sub-streams. These sub-streams are progressively recombined and re-divided between opposing baffles simultaneously; radial mixing occurs as the sub-streams are forced from the center of the pipe to the outer walls and back again. The final result is complete mixing in a very short tube length with minimum pressure drop. Maximum working pressure 180 PSI at 73 F.
Static Mixer 1/2" ID "clear" Schedule 80 with 24 polyplas elements. Available in 12" length with 1/2" male PVC ends. The geometry of this mixer consists of a series of left and right-hand helicals. 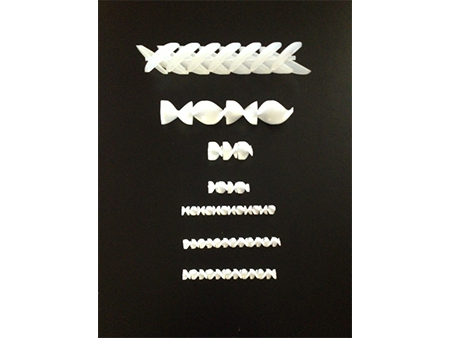 The elements leading and trailing edges are knife-edged. The elements effectively convert the tube into a maze or labyrinth. When fluids are pumped through the mixer, they are progressively divided and recombined. The result is efficient inline mixing. Comes standard with schedule 80 male PVC ends, other fittings and lengths available upon request. Various uses include biodiesel production, process control sampling, ozonation and chlorination, waste water treatment, and PH control. Maximum working pressure 420 PSI at 73 F.
Static Mixer 3/4" ID "clear" Schedule 40 PVC with 16 polyplas elements. Available in 12" length with male PVC ends. The geometry of this mixer consists of a series of left and right-hand helicals. The elements leading and trailing edges are knife-edged. The elements effectively convert the tube into a maze or labyrinth. When fluids are pumped through the mixer, they are progressively divided and recombined. The result is efficient inline mixing. Comes standard with Schedule 40 male PVC ends, other fittings and lengths available upon request. Various uses include biodiesel production, process control sampling, ozonation and chlorination, waste water treatment, and PH control. Maximum working pressure 240 PSI at 73 F.
Static Mixer 1" ID "clear" Schedule 40 PVC with 8 polyplas elements. Available in 14" length with male PVC ends. The geometry of this mixer consists of a series of left and right-hand helicals. The elements leading and trailing edges are knife-edged. The elements effectively convert the tube into a maze or labyrinth. When fluids are pumped through the mixer, they are progressively divided and recombined. The result is efficient inline mixing. 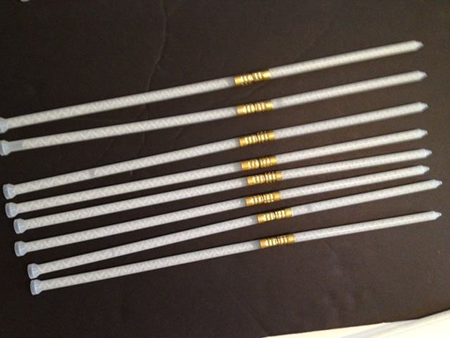 Comes standard with male PVC ends, other fittings and lengths available upon request. Various uses include biodiesel production, process control sampling, ozonation and chlorination, waste water treatment, and PH control. Maximum working pressure 220 PSI at 73 F.
Static Mixer 1" ID "clear" Schedule 80 PVC with 16 HDPE elements. Available in 12.5" length with male PVC ends. The geometry of this mixer consists of a series of left and right-hand helicals. The elements leading and trailing edges are knife-edged. The elements effectively convert the tube into a maze or labyrinth. When fluids are pumped through the mixer, they are progressively divided and recombined. The result is efficient inline mixing. Comes standard with schedule 80 male PVC ends, other fittings and lengths available upon request. Various uses include biodiesel production, process control sampling, ozonation and chlorination, waste water treatment, and PH control. Maximum working pressure 320 PSI at 73 F.
Static Mixer 1" ID "clear" Schedule 80 PVC 3 polyplas stages. This mixer has been developed for low viscosity mixing applications. Each stage consists of modular semi-elliptical baffles. These baffles are aligned along a central shaft with two intersecting bottom baffles and one opposing top baffle. As fluids pass through this mixer, they are divided into sub-streams. These sub-streams are progressively recombined and re-divided between opposing baffles simultaneously; radial mixing occurs as the sub-streams are forced from the center of the pipe to the outer walls and back again. 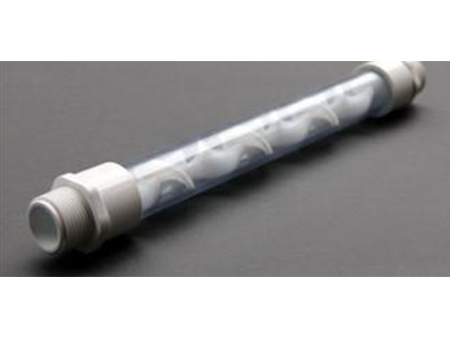 The final result is complete mixing in a very short tube length with minimum pressure drop. 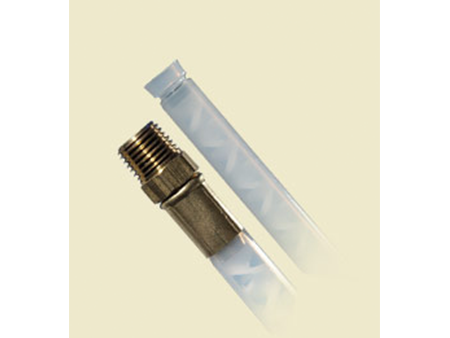 Comes standard with 1" male pipe thread, other fittings available upon request. 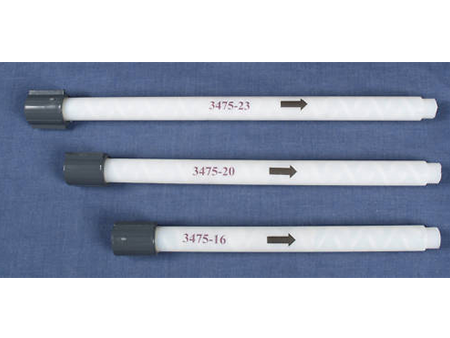 Maximum working pressure 320 PSI at 73 F.
Static Mixer 1/2" ID "clear" Schedule 40 PVC with 12 polyplas elements. Available in 6.5" length with 3/8" male PVC ends. The geometry of this mixer consists of a series of left and right-hand helicals. The elements leading and trailing edges are knife-edged. The elements effectively convert the tube into a maze or labyrinth. When fluids are pumped through the mixer, they are progressively divided and recombined. The result is efficient inline mixing. Comes standard with Schedule 40 male PVC ends, other fittings and lengths available upon request. Various uses include biodiesel production, process control sampling, ozonation and chlorination, waste water treatment, and PH control. Maximum working pressure 300 PSI at 73 F.
"SURE MIX A LOT" Static Mixer "clear" thick 1 1/2" or 2" Schedule 40 PVC housing with 6 stainless steel helical elements. Available in either 16" long or 20" long. Check your MSDS sheets and compatibility charts to match if PVC and stainless steel are compatible with your process. Available with BSP fittings at no extra charge. © 2018, StataMix, llc. All Rights Reserved.